Your friends and family have come from near and far to celebrate your special day and making your guests feel welcomed and loved is important to you! You’ve reserved room blocks at the best hotels in the area, arranged for transportation to and from the hotels and venue, and you wouldn’t dream of letting it stop there. Next step: Wedding welcome bags for your guests. You’re a few months out from your wedding and we get it. 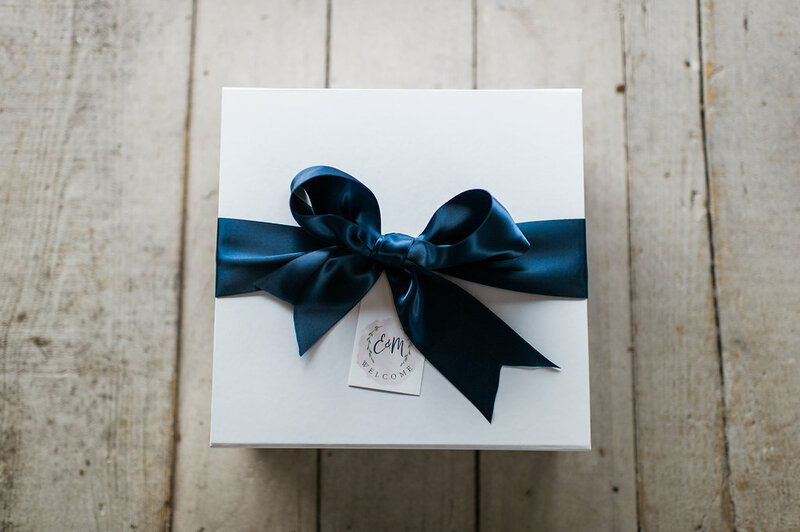 Wedding welcome bags (or boxes) aren’t exactly an extra item you want to add to your to-do list when all you want to be doing is checking things off of it. Here, we’ve listed our top five tried and true staple items – all of which have been done before and have been a big hit! Let us help take the guesswork and research off of your plate. After all, now is the time to get ready to celebrate, not the time to stress! A Welcome Letter: First things first – welcome your guests to your wedding weekend with a letter! Don’t forget any maps and brochures they may find interesting as well. Step 1 – Thank Them: Start with thanking your guests in a short paragraph for coming near and far to celebrate with you. Step 2 – Include Local Activities: Provide a handful of activities in the area that might be of interest, especially if they’re some of your favorite things to do and see near your wedding location. Step 3 – Wedding Weekend Event Details: Always, always, include the essential details for all of the events surrounding your wedding. Are you throwing a welcome party for your guests the night before your big day? Put the time and location details in there. Are you providing shuttles to and from their hotel on the day of your wedding? Let them know about the options. Ceremony + Reception Details? Yes, those too… there will always be a handful of guests who forgot to take the invitation with them. Brunch the next day? You get the picture. Snacks: Your guests, without a doubt, will thank you for a range of items to nibble on. You can include them in the original packaging, however, if you want to take it a step further, you can have them re-packaged and labeled with a design that’s consistent with your stationery theme. Below are a few thought starters. Something Sweet: Chocolate, cute gummy candies, caramels, etc. Something Salty: Kettle Corn – I don’t know anyone who doesn’t appreciate this staple. You can also go with something like Pop Chips or pretzels as well. Something Savory: Cookies (we love Tate’s! ), a locally baked treat if you’re in a specific destination, etc. Beverages: You can’t have snacks without something to wash them down. Bottles of Water: You can get a little fancy with San Pellegrino, or go with a tried and true water bottle. We recommend 2 per bag. Alcohol: If your crowd is the type to keep the celebrations, add a mini bottle of champagne or prosecco, nips and mixers. You can do one, or you can do all. Order drawstring bags from Etsy or small boxes to place all of the items in. Local Mementos: Are you traveling abroad for your wedding? Include something that represents the location. This could be as simple as a postcard that’s pre-stamped. Guests traveling to NYC? Include a pre-loaded Metro Card so they can get around the city. 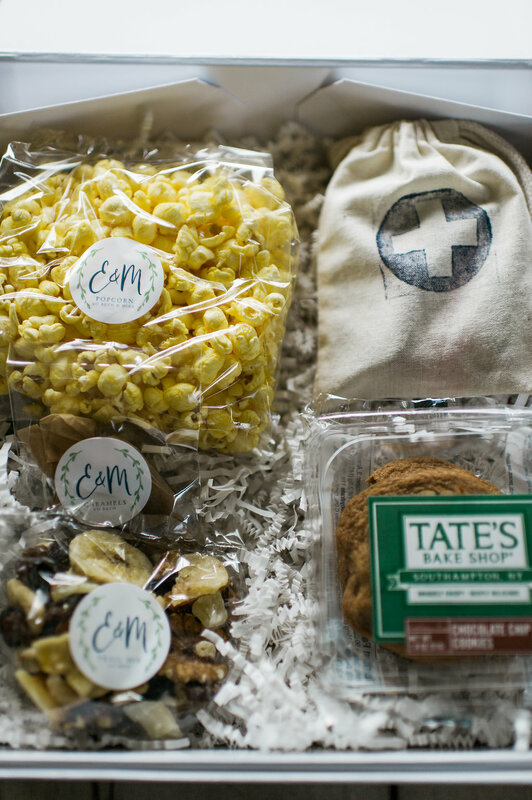 With these items included in your welcome bags, you can rest assured that your guests will feel appreciated and taken care of. And remember, as a general rule of thumb, if it feels like an extension of who you are as a couple and if YOU would enjoy receiving it, include it in your bags. 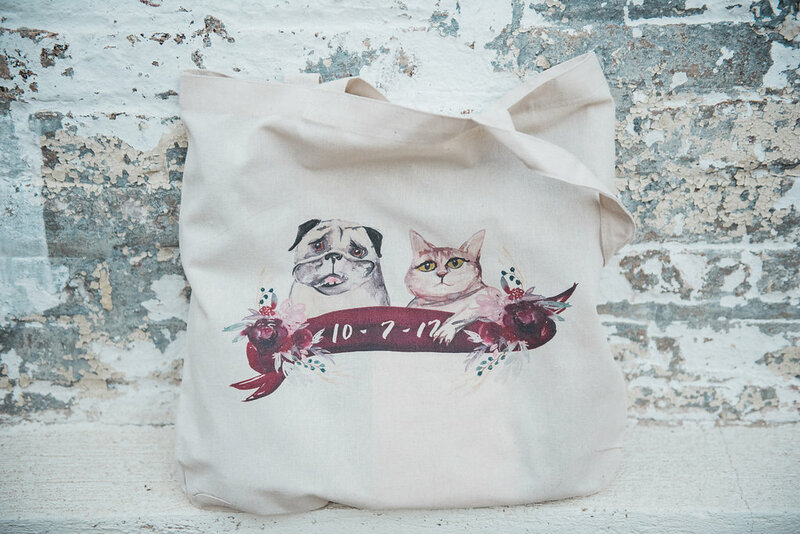 This extra thought will go a long personalizing your wedding welcome bags so your guests can enjoy them!